Amazing fa-Brick is a transparent fabric/textile hardener from Unbridled, LLC. Unlike most other high-end stiffeners, Amazing fa-Brick is manufactured in the U.S. I had originally intended this review to be a comparison review between this product, Paverpol, and Powertex, but only received a reply from the manufacturers of Amazing fa-Brick. As a result, this will be a review of this product only.Fabric/textile hardeners can be used on a just about any porous material and then molded to the shape you want. For example, doll sculptures with clothing, fabric coil baskets, crocheted or knitted bowls, jewelry, flowers, and much more. There are some photos of crocheted doily furniture – an ottoman, coffee table, and chair, for example – that would be possible to make using a fabric/textile stiffener.The kit I received included a container of the hardener and a pair of latex gloves. The gloves are not usually included but can be purchased separately. Instructions for using the product are on the back label of the container. The description indicates that the hardener can be used with almost any porous, natural material and once the liquid is applied, the item can be molded into shapes or draped of some type of armature, such as paper mache or a wire figure. Once dried, the item is water resistant and can be sealed with a waterproof varnish if it will be left outside or likely to come into contact with moisture. The hardener looks, feels, and smells like a white glue but dries transparent. It feels a bit sticker than white glue and a bit thinner as well. 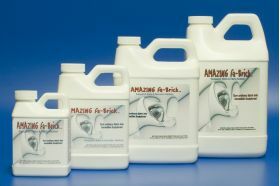 Amazing fa-Brick is made with a water based polymer and easily cleans up with water when still wet. It will not stick to plastic which allows you to use items like plastic bowls to mold your piece around or on. Because of the way it is formulated, there isn’t an issue with it being shipped during cold weather. For those who cannot use latex gloves, Unbridled sells a couple of protective barrier cremes that can be applied to your hands and will protect you from solvents that may irritate the skin. When working with Amazing fa-Brick, it works a lot like white glue and my sister said it reminded her of Aleene’s fabric stiffener. It worked easily into the crochet thread I used on my doily and, as promised, it did not stick to the plastic wrap I’d placed around a Tupperware bowl. It did stick more to the latex gloves which did make it a bit difficult to work the piece once it started drying a little. I was able to remove the gloves and finish molding the piece to the bowl without getting any product on my hands. There was no irritation either although I did make sure I washed my hands once I was done. Amazing fa-Brick does start to dry quickly so you’ll need to make sure you work enough of it into your piece so it is saturated without dripping or obvious blobs. 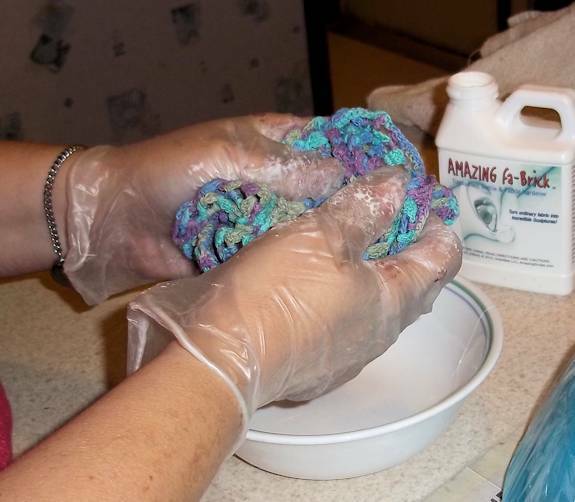 Before it starts to dry, any blobs will need to be either worked in or wiped off because once it starts to dry, it will be difficult to do it without affecting the finished product. As it starts to dry, the texture changes from a sticky film to a light rubbery texture and can be more easily molded into specific shapes, folds, and locations. Drying time will vary depending on the textile thickness, humidity, amount of Amazing fa-Brick used, size, etc. It seemed to dry faster than other products I’ve used, like Aleene’s, and the result was more consistent with no tackiness. The lacy bowl I made this with dried almost completely in about four hours. I was extremely pleased with this product and, even though it is more expensive than the ones you usually find in craft stores, the cost is worth it. You get a product that dries quickly with no tackiness, holds its shape well, and is moisture resistant. In addition, it is made in the U.S. so for those of us who live here, it is readily available without having to worry about import problems or shipping delays to the distributors – at least I’d hope that would be true anyway. I highly recommend this product. Please see the Just-a-Bowl pattern for details and photos of how I used this product.